This entry was posted on Tuesday, November 9th, 2010 at 4:00 am	and is filed under Apples and Cider, Breakfast and Brunch, Gluten Free (or Almost Gluten Free). You can follow any responses to this entry through the RSS 2.0 feed. You can leave a response, or trackback from your own site. Yum! I love that there are chopped apples inside, I bet that adds a wonderful texture surprise-these sound delicious! Looks great, Tinky. I think I will love ’em. What’s that flower doing on your spatula? I am now hungry for gluten-free apple pancakes. Neat! Off to FB and Twitter to share. Have a GREAT day. 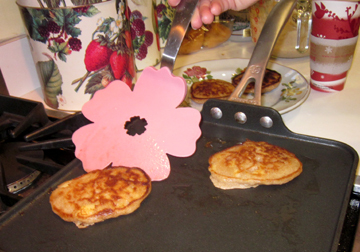 Love the nifty flower spatula. Who wouldn’t feel better about getting up early in the morning with such a spatula. I’m going to look for the gluten free flour. King Arthur really is my favorite flour, but sometimes I buy the store brand depending upon the balance in my checkbook. I’m going up to Charlottesville to visit my son and grandson and the trip always includes a trip to the apple orchard. Can’t wait to make these for my boys. 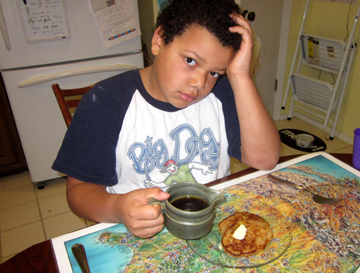 Oh – he looks all sleepy and cuddly …… and in need of Aunt Tinky’s delicious pancakes to set him up for the day!! They look terrific! I have a friend who found gluten-free Bisquick (or perhaps an equivalent) at a Walmart. I made these pancakes yesterday with half all-purpose and half-whole wheat flour. Wonder how the gluten-free flour would be…? I used a Golden Delicious apple and it softened up nicely in the pancake. My husband LOVED these fluffy, cinnamon-y pancakes. Thanks! EveryDay, the texture is indeed what makes the pancakes; grated apple would just be wet. Jack, I do adore the flower spatula–although it’s not the world’s most practical tool. Frayed, he is indeed a cuddly soul. Grad, have a great reunion–and remember you don’t have to use gluten-free flour (the same goes for you, Elizabeth, and thanks for passing along the word). Tut-tut, I’ll keep my eyes out for the Bisquick. Sue, I’m glad to hear they work with other flours; I knew they would! I will be making these very soon. They sound and look delicious!! What a great, great blog you have!